Click here to find out how to order your plate! We want to give you the opportunity to display this beautiful art as your Florida license plate. While displaying your love of lighthouses, you will be helping generate funds to restore these state treasures. The bill authorizing the "Visit Our Lights" tag was approved by the Florida Senate on April 28, 2008 by a vote of 35-4. On April 29, 2008 the House of Representatives gave it a 118-1 approval. The bill was forwarded to the governor's office, and Governor Crist signed it on May 28, 2008. Thank all of you for your support in bringing this about. The plate became available at the local tax collectors offices throughout Florida in mid December 2008. Now we can all give our full support by purchasing these tags and proudly displaying them on our cars. $25.00 from the sale of each tag will be used for the preservation and restoration of our 29 remaining historic lighthouses. 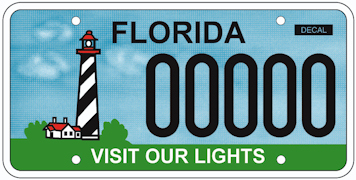 Our late president, Gene Oakes had set as his top priority the obtaining of a specialty license plate to raise funds for the preservation of Florida's historic lighthouses. Gene's untimely death came before he was able to obtain that goal. The Association was determined to accomplish what Gene had started and in 2005 established the Gene Oakes Memorial License Plate Fund with Gene's widow, Beverly Oakes, as chairperson. Three years later that goal was accomplished. Would you like to track the sales of the Visit Our Lights specialty tag? This link will take you to the Specialty Plate Sales Search Page of the Florida Department of Highway Safety & Motor Vehicles where you can track the tag sales by county or by month. How Can I Help Promote the FLA License Plate?